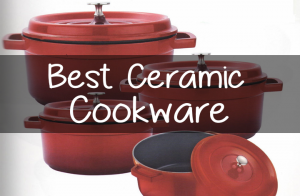 This is considered by us the best ceramic cookware on the market! 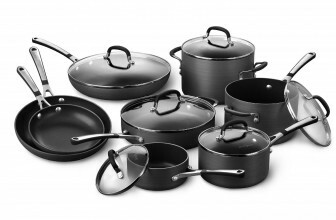 In our view, the Black GreenPan 12 Piece Rio Ceramic Non-Stick Cookware Set is the best available set on the market right now for those looking for ceramic cookware. Its thick aluminum base means the pots and pans in this set heat up quickly and then distribute that heat evenly across the pan. The high quality non-stick surface means you don’t have to use much oil if any. This makes your cooking healthier and makes cleaning a breeze. All pots and pans from Greenpan feature phenolic handles making them easy to grip and resistant to heat. The lids in this set are made from tempered glass meaning they won’t shatter even under extreme conditions. They also make checking on your cooking super convenient. Finally the feature a drip free edge which makes pouring out of these pots and pans quick and easy. For all these reasons we have picked the GreenPan set as our go to choice for those looking for the best ceramic cookware available. If however you’re looking to get the best return on what you spend then we highly recommend the Rachael Ray Cucina Hard Porcelain Enamel Nonstick Cookware Set. This twelve piece set is a steal for the current asking price and is definitely worth considering if value for money is what you are after. This 12 piece set is crafted from durable aluminum and features a sturdy porcelain exterior. Its PFOA nonstick surface doesn’t allow anything to get stuck and makes cleaning a breeze. Unlike many other cookware sets, porcelain cookware from Rachael Ray features fun and vibrant colors which brighten up any kitchen. This particular set comes in Agave blue and features espresso interiors giving each piece a designer finish. Oven safe up to 400 degrees, the pots and pans in this cookware set are suitable for every type of stove stop except induction. They also feature shatter proof glass lids which allow you to monitor your cooking without having to lift the lid and let precious heat escape. 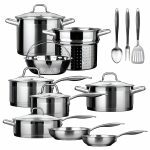 Usually to get all of the above you would expect to pay quite a bit more which is they the Rachel Ray cookware set is our choice for best value for money option. If you’re trying to save money at the moment you don’t have to sacrifice money as the Red Cook N Home NC-00359 Nonstick Ceramic Coating 10-Piece Cookware Set is our pick for those on a budget. When looking at cheaper ceramic cookware you do need to be careful because often cheaper options break easily and just generally don’t last very long, this isn’t the case with the Cook n Home set however. Its thick gauge aluminum construction is super conductive and doesn’t create hotspots. Its ceramic coating is lead free, cadmium free, PTFE-Free and PFOA-Free making it great for your health and great for the environment. The ceramic surface is also more scratch resistant than conventional non-stick materials. The handles feature a non-slip coating making them heat resistant, comfortable and safe to use. The exterior of theses pots and pans are coated in a heat resistant paint so it won’t peel over time. So what are the advantages of Ceramic cookware and who might choose to use it. Many choose ceramic cookware because of the health benefits. They argue that chemicals used to create artificial non-stick surfaces affect the food cooked on them and negatively impact the consumers health. Environmentalists often argue that those same chemicals are bad for the environment and therefore choosing ceramic cookware is the best way to go. Having said that, ceramic cookware also has many practical advantages and I have listed them below. Firstly Ceramic cookware is very heat tolerant. What this means is that it can heat up to temperatures which stainless steel post would melt at. Practically this means it can be used in almost any commercial oven without you having to worry about it melting or warping out of shape. Ceramic cookware is also one of the only substances which can be used safely in a microwave or in a freezer so it’s very versatile in that respect. Another advantage is that because ceramic cookware doesn’t use any chemicals to maintain its non-stick surface, it can endure a lot more scrubbing and cleaning before its non-stick properties begin to wear off. This makes cleaning and just using the cookware simpler and easier because you don’t have to be as careful as you do with some other types of cookware. So what should you be looking out for when purchasing ceramic cookware? The first thing you should look for is a well known reputable brand. Because ceramics are fairly easy to make there are a lot of low quality imitation products on the market. These inferior copies often aren’t well made and are liable to break or shatter when exposed to extreme heat. The best way to avoid being caught out is to purchase from a brand leader like the makers we feature in our reviews in this guide. Even when purchasing from a trusted source there are a few things you need to look out for. The first is how heat resistant is the cookware. The number should be upwards of 400 degrees fahrenheit. Anything below that figure may be a sign of a substandard product. You should also look at the colour of the cookware set you’re thinking of buying. Unlike other types of cookware ceramics lends itself to being brightly colored so before you make a purchase, ensure that its coloring will match the color scheme of your kitchen (If that’s important to you). Also make sure the paint on the outside is heat resistant. There is nothing worse than the paint on your cookware chipping because it looks awful and could potentially contaminate your food. 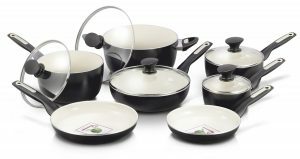 The first product we are going to review is the set we recommend buying if you’re looking for the highest quality ceramic cookware available and that set is the GreenPan 12 Piece Rio Ceramic Non-Stick Black Cookware Set. While it is more expensive than the other two sets we are going to review in this guide, we believe it’s worth every penny. It’s non-stick surface heats quickly, is easy to use and is easy to clean. It really is of of the best ceramic cookware sets available online, for more specifics as to why we think that’s the case, check out the rest of the review below. This specific set comes with 12 items and that includes 3 saucepans of different sizes, a casserole dish, a saute pan and two frying pans. It also includes 5 glass lids with black knob handles. The variety in this set makes it an ideal starter kit for those looking to try ceramic cookware You should have no problem preparing a wide range of different dishes with it. The only items in this set which don’t come with lids are the two frying pans. While these would have been welcome additions, they are not essential. The items in the Greenpan set all include a thick aluminium base. This is an important feature because ceramic bases do not distribute heat as quickly or as evenly as aluminium bases do. The interior of the pots and pans include a thermolon non-stick surface which is perfect for cooking even the most stubborn of foods. Very little sticks to the surface making the pots and pans in this set not only easy to cook with but also easy to clean. This particular set comes in black making it fit into just about any kitchen setting. However if you are after a little color, it is also available in brighter pastels such a turquoise. All Greenspan cookware features a cream interior that matches just about any colour you choose for the outside. 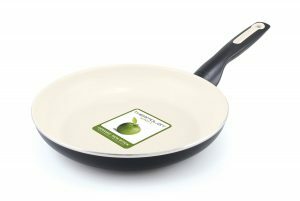 One of our favourite features of the Greenspan set is the non-stick surface. Not only does it make the pots and pans in this set easy to clean and use like stated above, it also makes your cooking healthier because you don’t have to use as much butter or oil. Even with a minimal amount of oil, we still found that nothing was sticking.The surface was so effective in fact that some foods didn’t require anything at all to cook without cleaning to the pan. So if you’re a health conscious cook and would like to avoid having to cook with fatty oils than this could well be the pan for you. Another great feature that we liked with this pan was that the thermalon surface conducted heat really well. The thermalon surface heated up really quickly and kept its heat even once we turned the burners down. We are not alone with this assessment either with many other reviews reporting that they could keep their burners on low or medium and that their food still cooked quickly and efficiently. We also appreciated the comfortable handles, the glass lids and the non-drip surface which made pouring from one pan to another really simple. There have been reports of some of the Greenspan pans losing their non-stick surfaces quickly, this shouldn’t be happening. If it does it means your product is either defective or you have used it improperly. In order to avoid the latter scenario make sure you always read and follow that manufacturer’s instructions before using any new cookware set. So if you’re looking for the best ceramic cookware available right now, we really don’t think you can go past the Greenspan set. Its non-stick surface is excellent, it looks stylish and comes with a wide selection of different cookware items. In our opinion it’s worth the relatively high price tag which is why it’s our recommendation for those looking for the highest quality product. 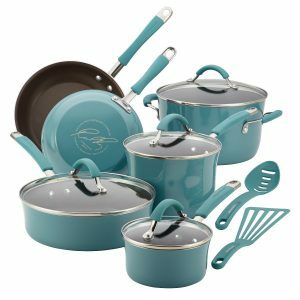 The next cookware set we are going to review is the one that we believe represents the best value for money and that’s the 12-Piece, Agave Blu, Rachael Ray Cucina Hard Porcelain Enamel Nonstick Cookware Set. We chose this set because it’s the best value ceramic cookware set available on the market right now and that it gives you the most bang for your buck when you consider the amount of features this set includes. The Rachael Ray Cucina set includes two covered saucepans , one 6-qt covered stockpot, two skillets , and one 3-qt covered saute pan. While a 12 piece set is nothing out of the ordinary the variety of pieces in this set will assist you in preparing a wide variety of foods. The saute pot for example will be ideal for cooking burgers while the large stock pot is great for boiling potatoes or making soup. The set also includes a slotted turner and slotted spoon which work seamlessly with the cookware and won’t scratch the nonstick surface. Such inclusions are one of the reasons we believe this ceramic cookware set is such great value for money. Rachael Ray ceramic cookware is well known for its excellence in aesthetic design and this particular set lives up to her reputation. Each piece has been crafted to look stunning as well as being functional. This set comes in alluvial blue which is sure to lighten up your kitchen. One of the advantages that comes with looking so stunning is that these ceramic pots and pans can double as serving dishes, even at dinner parties and other formal occasions. We were really impressed with the lids on this set. They fit well which is actually more important than you may think. If a lid fits to loosely then it will not only not keep the heat in but it is also liable to be knocked off while cooking. On the other hand if a lid fits too tightly it can be annoying to lift off and can potentially pos a safety hazard. These lids fit perfectly and won’t cause you any issues. On top of this they are also made of shatterproof glass. This is glass which has been especially designed to withstand the high temperatures that cookware lids will likely be exposed to. Unfortunately some cheaper options often don’t make use of the same technology and this can lead to cracking and chipping. What’s more the fact that the lids are made of glass allows you to watch your cooking constantly, this is a great help for beginners and is a feature we believe more cookware sets should incorporate. One downside to this set that has been mentioned by other reviewers is that the surface scratches very easily. This may well be true as the ceramic non-stick surface is fairly fragile compared to other types of cookware, this just the nature of the material. Scratching however can be avoid by being gentle where possible and only using plastic utensils like the one included with this set. If you’re careful you shouldn’t have a problem. For the price you pay for this set you get an awful lot in return, which is why they are our pick for those looking for the best value ceramic cookware. Many of the above talked about features are usually only found in sets which cost twice as much. Don’t pay more than you have to. If you want value you can’t go past the Rachael Ray Nonstick cookware set. The final product we are going to look at in this guide is the set to buy if you’re looking for the budget option. You do have to be careful when purchasing ceramic cookware because there is a lot of cheap but low quality products available on the market. 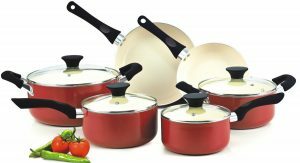 Fortunately however this is not the case with Red, Cook N Home NC-00359 Nonstick Ceramic Coating 10-Piece Cookware Set. This high quality product is functional, stylish and affordable which is why it is our pick for the best budget ceramic cookware. The Cook N home set includes 10 Pieces in total. Inside the box you will find one Covered Dutch oven, one covered casserole dish, one covered sauce pan, one larger covered sauce pan, one 8 inch fry pan and one 9.5 inch fry pan fry pan. This particular set comes comes in red but many light and dark colors are available depending on what shade will suit your kitchen. The paint on the pots and pans in this set is heat resistant meaning you won’t have to worry about it peeling over time. 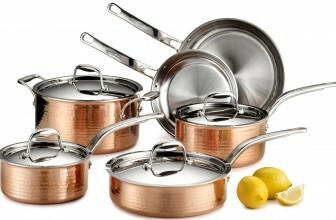 The cookware in this set is primarily made of a thick gauge aluminium which has a ceramic coating. This ensures the pots and pans heat quickly, efficiently and evenly. Aluminium is a great material for getting an even distribution of heat and avoiding hot spots which is undoubtedly why Cook N Home chose it as their material of choice. Ther ceramic coating creates the non-stick surface and also increases the cookwares capability of handling high temperatures. The non-stick surface on these pans is high quality and doesn’t allow even the most stubborn foods to hang around. We also found that cleaning was very simple as everything just seemed to slide off, like you would expect of a higher priced cookware set. Cook N Home go to great lengths to stress that this set is PTFE-Free, PFOA-Free, cadmium free and lead free. Basically they are saying that this set does not use the same chemicals that other cookware sets do to achieve their non-stick surfaces and this is true since ceramic cookware in just naturally nonstick. They further claim that the above chemicals are bad for your health and should therefore be avoided by using ceramic cookware. Whether or not you believe this claims in entirely up to you. But if you’re the type of person who wants to be on the safe side but also doesn’t want to spend a lot of money than the Cook N Home ceramic cookware set may be the right choice for you. What is not in question is the fact that this cookware set along with the ceramic cookware sets we have reviewed in this guide require much less oil and butter to cook most foods. This alone makes them much better for your health. Some of the features we really like about the Cook N Home ceramic cookware set include the tempered glass lids which are heat resistant and allow you to watch your food while it cooks, The handles which feature an anti slip coating to allow for easy pouring and manoeuvrability and the fact that this set works well with many different types of burners with the notable exception of induction burners. One complaint which is common with the Cook N home set is that the color starts to fade after a couple of month of continued use. 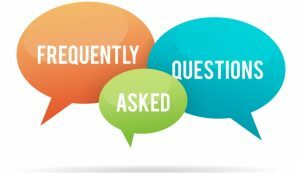 There are a range of factors which could make this occur including how frequently they are used, for how long they are used at a time and weather or not where they are stored exposes them to direct sunlight. Whatever the cause some discolouration in a set like this is to be expected. If you want a set which keeps its colour really well then you best opt for one of the other sets reviewed in this guide. If however you’re on a budget and you prioritize functionality over presentation than this may well still be the set for you. 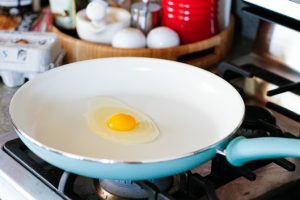 Do other types of cookware really use dangerous chemicals to achieve their non-stick surfaces? 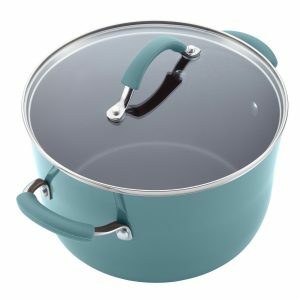 Other types of cookware do use chemicals such as PTFE and PFOA to achieve their non-stick surfaces that much is not in question. What is in question is how harmful these substances are. So far no major western country has banned the use of these chemicals nor has there been any studies which have shown a conclusive link between them being used in cookware and significant harm to humans. However just because the studies don’t exist doesn’t mean the chemical are not harmful and just because they might not kill you doesn’t mean they are good for your health. Opponents of their use would argue that there is evidence of harm and that it just makes sense that you don’t want to be cooking in chemicals which in other circumstances could be considered dangerous. 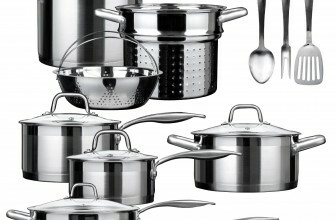 At the end of the day it’s up to you to decide what sort of cookware you will use. Their is plenty of information on this topic available online. What we will say conclusively is that choosing ceramic cookware doesn’t have to be a sacrifice. There are plenty of reasons why you might choose ceramic cookware independently of the health concerns so you don’t lose anything by playing it on the safe side. 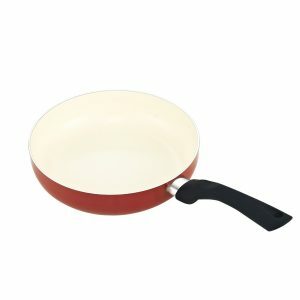 Does the non-stick surface on ceramic cookware wear out after a while and if so how long can I expect mine to last? The short answer to the question is yes. After prolonged periods of use the non-stick surface will start to fade and when that happens it’s probably a good time to start looking for a new cookware set. Its very difficult to predict when this will be however. If you treat your cookware properly than the nonstick surface can last for years. If however you fail to read the manufacturer’s instructions it could start to fade after only a couple of uses. If you don’t scratch the nonstick surface with metal utensils and your gentle when washing then you should have no issues. I found some ceramic cookware at my local goodwill store, will it be just as good as branded ceramic cookware? Unless the ceramic cookware at your local goodwill store happens to be brand new branded cookware than the answer is a definite NO. There is a misconception that ceramic cookware is all basically the same but nothing could be further from the truth. Ceramic cookware is relatively easy to make but this means the market is flooded with low quality rip offs and sub standard products. These products won’t cook well, they will be difficult to clean and most importantly, they won’t last. 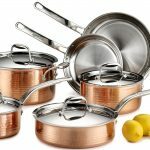 If you want high quality ceramic cookware then your only option is to purchase from a reputable brand. Yes its costs a bit more but trust us, the investment is worth it in the long run. Before you add anything, let you pans heat up first – This will probably go against your instincts which tell you that placing an empty pan on a burner will cook the bottom and damage the pan. That however isn’t the case when you’re cooking with ceramic cookware. Ceramics are designed to be able to be heated up on their own without any damage being done to the cookware. By allowing the pan to heat up first you actually decrease the chances of damaging the nonstick surface. You also ensure that your food will cook quickly and evenly. Don’t start with the heat on high – Ceramic cookware can take a little while to heat up and this can lead some to turn the heat up in frustration. Don’t give into that temptation. Doing so may lead to you damaging your cookware. Instead just wait for it to heat because once it does it will retain that heat without you needing to keep the temperature at high levels. Doing this will take some getting used to but it will eventually become second nature. Many foods won’t require oil – The great thing about ceramic cookware is that much of the time you won’t need to use any oil or cooking spray. This is because the nonstick surface is able to keep your food from sticking all on its own. This is a great feature because it will make your food tastier and healthier. Some more stubborn foods will require some oil, but far less than conventional cookware. Just use common sense and you should have no problems.